Panamax is the country’s pre-eminent designer and manufacturer of electronic and electrical protection, filtration and control products. For over 30 years we have achieved an international reputation for our unique solutions to the worldwide problem of power disturbances and has earned numerous industry awards for the quality and variety of its products. Panamax has also been recognized for its innovative Lifetime Warranty on almost every unit produced and for its Connected Equipment Protection Policy. 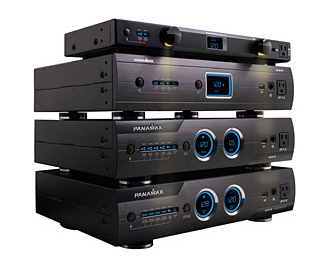 Panamax acquired Furman Sound in 2006, which now operates as a second brand within Panamax. Both brands were founded about thirty years ago, both doing power management but for different purposes. Furman started doing power management for the professional music industry. Panamax started making surge protection products for industrial and commercial customers. Both companies moved into power management for home theater within the past ten years each with their own emphasis and technologies. The first to introduce automatic over/under voltage protection, resulting in less service calls and trouble-free surge protection technology. Panamax introduced the towerMAX® and AllPath® modular protection systems that address a wide variety of AC and other signal line combinations, allowing customers to expand their protection as needs grow. The first to combine AC and telephone/modem protection, AC and coax cable protection (CATV and Satellite), protection specifically for satellite systems, and AC and LAN/data line protection.